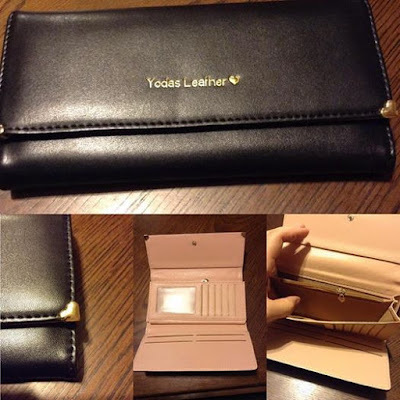 Recently I was able to review this really nice wallet from Leiwo. I love the little heart accents and how it is carried out on the logo and even on the zipper pull on the inside coin pocket. This will go perfectly with my new purse that I haven't started to use yet. There are lots of slots for cards, your picture id, and still room left over for money and change. The color on the inside of the black wallet is a peach color. There are a few colors to choose from which makes it easy to mix and match with your purses for the perfect look. This wallet can be found in several colors on Amazon. What Leiwo has to say about their product. Usage: Put it into your handbag, can hold bills, change, credit cards, photo, ID card, business card, etc? Disclosure: MarksvilleandMe received one or more of the products mentioned above as part of a promotion with Tomoson and Leiwo. Regardless, MarksvilleandMe only recommends products or services we use personally and believe will be good for our readers. Some of the links in the article may be “affiliate links.” This means if you click on the link and purchase the item, I will receive compensation. If you would like MarksvilleandMe to review a product or service please contact us at marksvilleandme@gmail.com.